First impressions of GM’s much-ballyhooed electric car of the future. Today on the westernmost fringe of Manhattan, in a nasty rainstorm, FastCompany.com got to test drive the Chevy’s all-electric, plug-in Volt. Having cost GM billions in R&D, it’s a technical marvel well ahead of it’s time. And it won’t be making money anytime soon: When the Volt finally hits market after a whirlwind, moonshot development process, it’ll be limited to just 10,000 units in California, Washington, D.C., and Michigan. (A profitable product run would likely be 40 times that.) With a price tag somewhere in the low $30,000 range (after a $7,500 government tax credit) each one will be sold at a loss. For GM, this is the quintessential halo product, meant to catapult it to the forefront of consumer consciousness. All of which places a huge burden on its design and technology: When people see the first ones on the street, will they coo and stare? Will they text their friends? Will the allure of its curves and tech be enough to demand a $3,000-$5,000 premium over a Toyota Prius or a Ford Fusion Hybrid? Our test drive was admittedly short–comprising just a mile or so around a very short circuit, at low speeds–but we came away with some firm impressions. 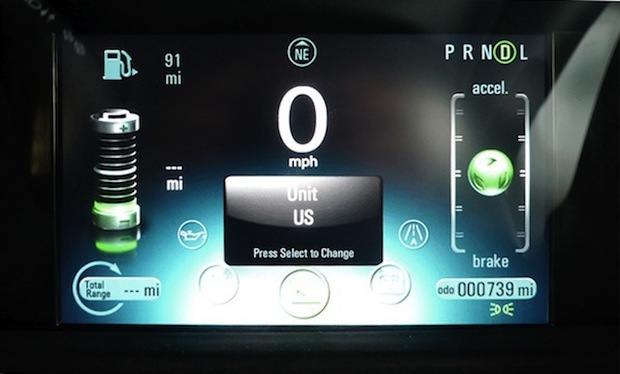 Impressive as the Volt is tech-wise, that message is lost in the design. It’s not a bad looking car. But you’d be hard pressed to tell what’s so special about it, if it was driving next to you. A big proviso: What we drove was the pre pre-production car, one of the first run of 80, hand-assembled in Michigan, and one of only two being made available for press runs. But according to the engineers and designers on hand, it represents about 95% of the finished model. From here on out, the tweaks will be very minor. At the press of a button, the engine whirs softly and immediately delivers crisp, firm acceleration–the hallmark of an electric engine. (Gas engines have little torque at low RPM’s; electric motors have nearly maximum torque out of the gate.) The ride feels rock solid, presumably aided by the massive, 400-pound battery that runs through the middle floor of the cabin, ending a “T” right below the rear seats. The car handles nimbly–it’s not a sports car by any means, but it feels light and responsive. We were fortunate enough to be inside during one of the big moments for engineering nerds: The switchover that occurs after about 40 miles of driving, when the gas-generator switches on to recharge the battery and offer extended range. There were no hitches or weird noises–both bugaboos of electric cars of the past. The switch isn’t even audible over normal conversation–just a soft purr. As with an electric car, it runs extraordinarily quiet. On the curb, the Volt’s a pretty handsome car. But it’s not electrifying, and it doesn’t stand out too much from the rest of the GM/Chevy line (like Toyota’s first Prius did). When you look close, you’ll notice that the lines flow smoothly from the front fascia, across the hood, and down the rest of the car, without too many bold curves–all so that wind doesn’t have anything to get caught on. In the back, at the trailing edge of the trunk, the car ends with “blades,” literally cutting the wind off, rather sticking to the car, causing turbulence and thus drag. Elsewhere, there’s been hundreds of hours of testing were lavished onto the smallest details: For example, there’s a barely perceptible curve in the trunk lid, which supposedly yields another 1/4 mile in range. Meanwhile, the windshield wipers are shielded from the air, and the side mirrors have been pulled out—both to reduce noise from wind buffeting, which are particularly noticeable in the uncanny quiet of an electric car. Here’s where things get shaky. The interior is decent-looking, but unremarkable–an obvious hodgepodge of pieces from the rest of GM’s line, which has admittedly gotten a lot better looking in recent years. But the most eye-catching part is also the tackiest: The white center column, which houses the radio and climate controls, is studded with capacitive touch-sensors, like you find on new flat-panel TV’s. It also has the too-shiny, too-plasticky look of a fake Chinese iPod. Meanwhile, the dashboard controls–which are almost certain to be refined–are currently confusing and jumbled. But there’s one nifty feature that should stand out if those issues are resolved: To the right, there’s a floating ball that glows green when you’re driving efficiently then turns a fiery orange if you’re gunning the motor and sapping the range. Chevy is still grappling with the right way to sell the car. They’ve claimed that the Volt may cost as little as $1 a day to charge and drive, compared with $3-4 for your typical 30 mpg sedan. Numbers vary, and that fight over clarity might muddy an already difficult sell. Obviously, MPG is a big feature of a greener car, but normal MPG doesn’t really apply since you could conceivably run this car on electricity alone, if you never drive more than 40 miles between a charge. (The average American commute is 33 miles.) GM’s trying to lobby the EPA to adjust its mileage ratings, and that might prove to be a key. But more than that, an electric car obviously isn’t a silver bullet for carbon emissions–whether or not its actually green depends on whether the grid it’s drawing power from is renewable or not. In places where coal-fired plants rule, the benefit is far less than in places like California, where the carbon savings could be vast. Ultimately, the greatest long-term effect of electric cars such as the Volt might be to shift coal to centerstage, in our quest for cleaner fuels. It’s surely not an accident that the Volt’s being marketed first in Michigan, Washington D.C., and California: The Volt’s far enough ahead of its time that it’ll take some powerful backing from governments to make all the numbers make sense. We’ll see if they do–and whether the intangibles like design do the rest. What’s strange is that GM, having taken a huge risk in even developing the car to begin with, seems to have gotten more and more conservative and familiar with its design over time. And perversely, that might dull the Volt’s chances for success, rather than raising them: If you’re going to start with a risk, why wouldn’t you end with one too?